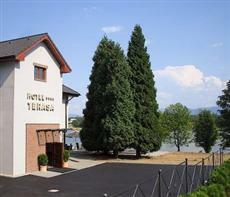 Four-star hotel located in a beautiful landscape on the bank of "Olesná“ dam near Frydek-Mistek. Its windows open a lovely view to the highest mountain of the BESKYDY mountain range – Lysa hora. It is an easy task to find the hotel as it takes only two minutes to get there from D47, the motorway connecting Czech Republic and Poland. At the same time you can get from there to the centre of Frydek-Mistek town in less then five minutes. The hotel is offering fifty beds in two/three bed array and apartments (15+5+2). Every room features complete accessories including TV, radio, telephone, hair dryer and a miniature bar. There is also a parking next to the hotel, designed only for the hotel guests. Inside the hotel you can find a cozy bar and a restaurant with a large-screen TV. The room can be re-arranged according to client´s needs and requirements. About fifty metres from the dam´s bank you can enjoy the landscape and/ or your meals and drinks on a summer terrace. Guests can also take advantage of the cozy bar and restaurant with a large-screen TV. The hotel summer terrace with a wonderful view of countryside is an ideal place for relaxation. The wellness center features among others a Finnish sauna, whirlpool bath and a steam room. The recently completed aqua-park has been welcomed first of all by kids, but not only by them. The same can be said of the new riding hall built alongside.